Gluten-Free Oat Flour, Whey Protein Isolate (Whey Protein Isolate [Milk], Soy Lecithin), Pea Protein, Cinnamon Flakes, (Sugar, Vegetable Oil (Palm, Palm Kernel) Cinnamon, Soy Lecithin) Apples, Cinnamon, Buttermilk, Butter (Butter (Cream, Salt), Dry Buttermilk), Baking Soda, Baking Powder (Monocalcium Phosphate, Sodium Bicarbonate, non-GMO Corn Starch), Xanthan Gum, Natural Flavor, Sea Salt, Monk Fruit, Probiotic (Skim Milk Powder, Bacillus coagulans GBI-30 6086). 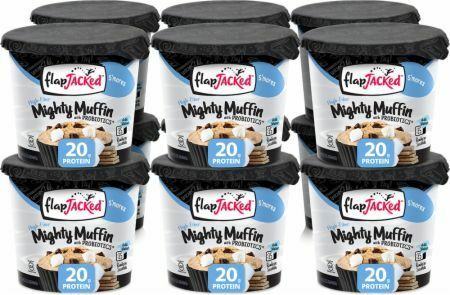 A FlapJacked Mighty Muffin is a delicious, gluten-free, protein-packed and high-fiber muffin developed with scrumptious flavor, balanced nutrition and convenience in mind. Bursting with pockets of flavor in every bite, Mighty Muffins pack 20 grams of protein and 220 calories in each serving (1 container). We’ve even added the benefit of probiotics to help you support Immune Health as part of a balanced diet and healthy lifestyle. Simply add water, microwave for about 35 seconds and you have a delicious meal or snack on the go. Blueberry This is a Buy 1 Get 1 FREE offer! Cinnamon Roll This is a Buy 1 Get 1 FREE offer! Double Chocolate This is a Buy 1 Get 1 FREE offer! Lemon Poppy Seed This is a Buy 1 Get 1 FREE offer!